A night after watching Kaleb Driggers and Junior Nogueira pull into the lead, team ropers Clay Smith and Paul Eaves answered. 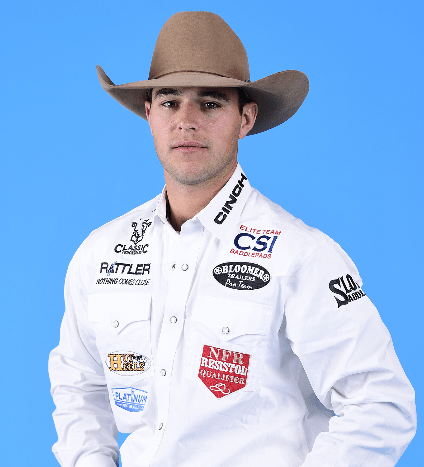 Smith and Eaves kept pace with Driggers and Nogueira by posting a 4.0-second run Friday to win Round 2 of the Wrangler NFR. The victory pulled Smith within $3,838 of Driggers in the team roping heading and Eaves within $4,822 of Nogueira in team roping heeling. But with only two rounds down and eight to go, the race for the team roping buckles is far from over. “It’s a long week still, far from being over, but it’s sure nice,” Eaves said. Smith is hoping they can do it again. After recording a no time in the first round, Round 2 was a bit of redemption for Smith and Eaves. “I missed the first round, so it sure helped to get some money the second round,” Smith said. That money made a big difference. “For me, I’m just in it to win it, it’s good money and good to be here,” Eaves said. After two rounds, Smith is up to $151,575 in heading earnings, while Eaves has the same amount in heeling money.